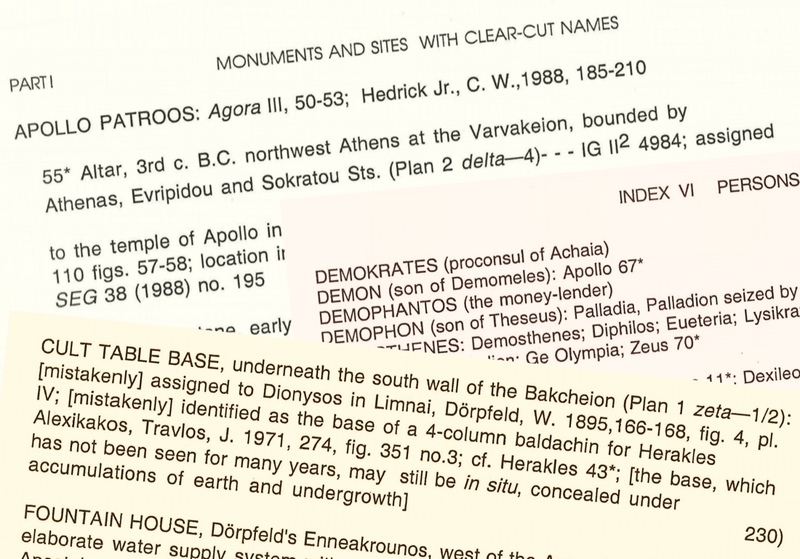 The Monuments and Sites of Athens: A Sourcebook was a lifetime project of Judith Binder, who entrusted the work to us when she left Greece for Germany a few years before her death. The manuscript is in the process of being digitised in order to be preserved and made readily accessible to researchers. Following the initiative of our collaborator Robert Pitt, the first stage of scanning of the two volumes has been completed, in order to exploit the vast wealth of primary information collected within them. It is essentially a research tool, since it collects all sources (ancient writers, archaeological data) for Athenian topography. Judith Perlzweig Binder (1921-2013) settled in Athens in 1952. After a long-term collaboration with the American School of Classical Studies, she remained Senior Associate Member of the School until 2008. Among her most significant publications are: a) Lamps of the Roman Period: First to Seventh Centuries after Christ (Agora VII, 1961), b) Lamps from the Athenian Agora (Agora Picture Book 9, 1964) and c) "The West Pediment of the Parthenon: Poseidon" in Studies Presented to Sterling Dow (Greek, Roman, and Byzantine Monographs 10, 1984).